Are you Potiphar's wife, or are you Joseph? Genesis 39:7-12 has an interesting lesson for us Christians in the last days. Now, the following really happened to two real people. The scene is part of a continually unfolding lesson to us through scripture of God's love and His ultimate control of all circumstances. It shows us His long-term plan for His people. But I've been thinking a lot lately on the truth of the Word and the way that sin in the world winds around it, like a strangler fig, trying to kill it. Sin does that. Kills you. Potiphar's wife and Joseph's reaction to her came to mind as I was thinking. I love the truth of God. The bible is an incredible book, written by 40 or so authors over 1500 years yet it contains a single message unified over time and through time. It can only have been written by Someone outside of time, and that is Jesus and the Holy Spirit who God-breathed it to men. (John 1:1, 2 Timothy 3:16). We are told repeatedly that the last days would be filled with deception. (2 Peter 2:1-3; Mt 7:15; 1 John 4:1; 1 Timothy 4:1). We are told not to cling to the things of the world. "Do not love the world or anything in the world. If anyone loves the world, the love of the Father is not in him." (1 John 2:15). "Now Joseph was well-built and handsome, and after a while his master’s wife took notice of Joseph and said, “Come to bed with me!” But he refused. “With me in charge,” he told her, “my master does not concern himself with anything in the house; everything he owns he has entrusted to my care. No one is greater in this house than I am. My master has withheld nothing from me except you, because you are his wife. How then could I do such a wicked thing and sin against God?” And though she spoke to Joseph day after day, he refused to go to bed with her or even be with her." "One day he went into the house to attend to his duties, and none of the household servants was inside. She caught him by his cloak and said, “Come to bed with me!” But he left his cloak in her hand and ran out of the house." (Genesis 39:7-12). Joseph ran. He didn't make friends with sin. He didn't tolerate sin. He didn't flirt with sin. He didn't reason with sin. He ran. Now, the world will seek us the same way, with outstretched hands, with a winning smile, with pleading and guile. When those fail, sin will try to grab you. Don't let it. Run. The Prince who is to come is the antichrist. (Daniel 9:26-27). He is also called the man of Lawlessness. Lawlessness in this case means he has not one scrap of God's Law in his heart. (2 Thessalonians 2:3). He is completely devoid of anything good. He also will seek the world and the world will accept him. (John 5:43). He also will outstretch his hands and with guile and a winning smile and flattery, and insinuating himself he will make a grab for the world. 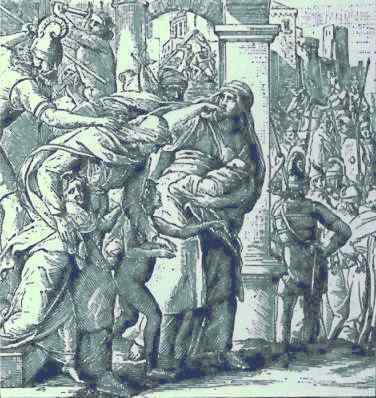 (Daniel 7:8, Daniel 8:25; Zechariah 11:15-16). Jesus said that when you see this, run. (Matthew 24:16). Don't even stop to get your cloak. (Matthew 24:17-18). Christians who are left behind and living in the Tribulation are warned severely to stop for nothing but like Joseph, flee even if it means leaving behind what you are wearing. Wow, well written and timely! Thanks for warning the church, we truly need to wake up and hear the bridegroom's voice and respond to it. Wow the headlines are just so gripping! Are vampire babies even possible? Spaceweather reports "remarkable solar activity"